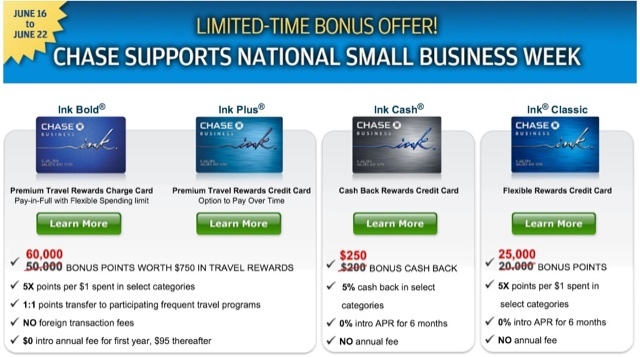 In honor of small business week, Chase is offering 60,000 Ultimate Reward points on their Ink cards after a $5,000 spend in 3 months. The usual offer is for 50,000 points (which is already one of the best sign up bonuses out there), so this is a really good deal. As mentioned in my post here, Chase Ultimate Reward points can transfer directly to several hotel or airline programs. This gives you great flexibility when it comes time to redeem them. The Ink cards are small business cards and the Ink Plus and Ink Bold are the ones that offer the new sign up bonus. You can apply for these cards with a "business" of any size - even a sole proprietorship that sells things on ebay. Just use your SSN as the tax number and your name as the name of the buisness.